What comes to your mind when you think of a safari? Do you picture adrenaline rushing through your body as you watch a hunt? Maybe being at one with the wild, or the spectacular view of merging hills and a magnificent blue sky? Possibly driving a car or being driven across the savannah on an open roof van? Since I could remember animals have always fascinated me, and when I got a chance to go on a three day trip to Maasai Mara and see the big five, this February, how could I say no! I can assure you, nothing is as exciting or should I say, nothing feels as surpassing an out of this world experience as successfully stalking animals and taking memorable pictures of them. In order to beat the Nairobi Jam, which is not short of disastrous, we had to leave early, around 6.30am. I am right to suggest, Nairobi traffic should be quoted as the ninth wonder of the world. Those who have encountered the Nairobi traffic, can freely tell you the horror stories associated with it. The roads within the city are fairly okay, though you surely cannot give them a five star rating. Once outside the city, one is welcomed with a wealth of flora and fauna, and should I add the air is quite fresh too, but then there is a downside, roads are filled with potholes, and the best you can do, is hope to get a driver who is quite skilful at manoeuvring them. Our first stop for the day was at the Rift Valley, which is a renowned landmark not only in Kenya but all over the world. 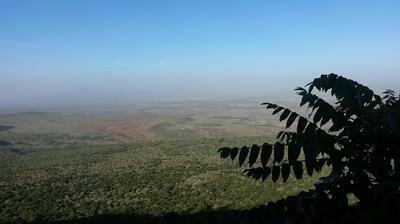 The viewpoint is always a perfect place year in and year out. It was quite exquisite being able to watch the enthralling Rift Valley with its vast vegetation and far away mountains in the backdrop, it does offer great photo opportunities. There were already some tour cars, with tourists taking photos and shopping for souvenirs in the curio shops that line the viewpoint by the roadside. On a normal day most of the shops take advantage of gullible tourists stopping by, in terms of prices of the commodities, but if you see something you really like, you can request your guide or your driver to negotiate for you. After we dully fed our eyes with the surrounding exquisiteness, it was time to hit the road again. Just a few meters past the Great Rift Valley Viewpoint, on the Mai-Mahiu road we were able to spot among the world’s smallest catholic church, thanks to our driver, John, sharp instincts. The church was apparently built by the Italians, in 1942, under strict British supervision. Sadly most of them were either mauled by animals or they succumbed to malaria. The church can sit a maximum of six people, I believe six really skinny people, Due to time constraints, we were unable to go on an excursion in the church. All that I could take in was a pentagon shaped building. I thought the roads could not get any worse, but with each transiting kilometres it got from bad to worse. It was amazing citing peaceful trees swaying with the wind, moving to some imaginable rhythmic songs, the trees are mainly referred to as whistling trees. Watching Zebras grazing quite early in the morning, and baboons trying to cross the road and looking at us suspiciously. Our final stop before Maasai Mara was Narok town, actually Maasai Mara is located in Narok. I remember screaming civilization! Civilization! In my mind, we did pass smaller town on the way, but honestly I had already started missing the buzz and noises associated with big towns and cities. There is a mall situated at the centre of the town, I took this opportunity to buy a few things, one thing I learnt getting sun block is super important, unless you fancy a burnt face, then you definitely can do without it. The mall goes by the name ‘Narok Oltalet Mall’ a Maasai word that means a strong tower. We were back on the road a few minutes later. The road towards the Game park is the worst, John actually referred to as the ‘Dancing road’ and be sure you will be forced to dance unwillingly, for ninety minutes, we danced, moved up, down and sideways in the van, but I believe the roads add up to a memorable Safari too. The first change you will encounter is the untarmac and bouncy roads. Driving to the Reserve from Narok town will take about two hours. The road is quite broken up, more of a dust road with potholes and thus the application of special attention will be needed. 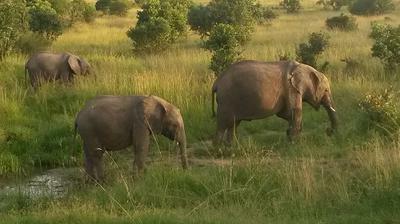 One can always opt to fly to maasai mara. As we approached the camp we started citing many of the local Maasai people as well as their live stocks which surround the national Reserve. On arrival at the reserve the first place we checked into, after the park fees were paid was our lodge, which would be our home for the next three days and two nights. Natural world Safari, as part of the tour package had booked us into Sentrim camp, which was more than I what I had envisioned. The camp is not only beautiful, but it is engulfed in tranquil surrounding. Friendly stuff, awesome buffet for the three days we were there, private balcony and comfortable beds were part and parcel of the camp, did I mention the pool area is very clean and relaxing? The rooms can be described as permanent lodges, each fitted with coffee makers, in-room safe box, bottled water, housekeeping a desk and there is hot shower too. The only down part when at the camp, was weak WiFi and electricity was only switched on during morning and night hours. After lunch and a little bit of relaxing, we went off for an afternoon drive. 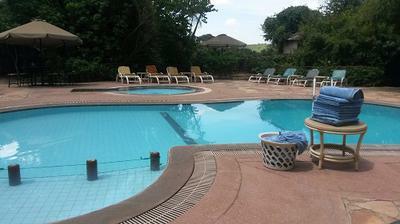 The park is made up of gently rolling grassland and dotted with flat topped acacia trees. The first animals I saw was a heard of Zebras and Wilder beasts, feeding at a distance, a few seconds later, a Dik Dik, scrambled for safety in a nearby bush, I guess out of fear after spotting our the van. It felt like the park had sprung to life, with activities happening left, right and centre. It was amazing watching giraffes nibble on acacia trees, those animals are quite tall. The roads within the park aren’t any better, so brace yourself for deeps and dives. The list of animals spotted that afternoon was endless, Elephants fairly known for their huge sizes, Hartebeest part and parcel of the gazelle family, given the name because of their heart shaped horns. I also spotted some baboons and their youngsters, Topis, distinct with black patches that appear on the face, upper forelegs and on the hips and thighs. Before we called it a day, we were lucky to be graced by the presence of a cheetah, sprawled under a bush, I believe this is due to the hot weather. We called it a day, and retired to the camp, for the next day would start with an early morning drive. The next day we woke up to an early breakfast. The selection of the food to eat was excellent and it catered for both vegetarians and non vegetarians like me. The plan for the day was to spot as many animals as one could, and something I was really looking foward to, a visit into the Maasai village. The early morning and late afternoon are the best time to go for a game drive, this is mainly because, due to the cool temperatures mostly in early mornings, the animals are quite active. 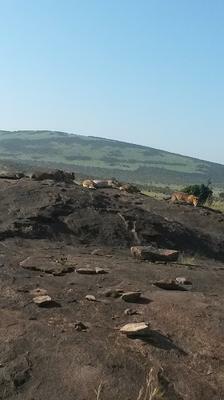 Luck was on our side, for we managed to spot a pride of lions on top of a rock. I decided to nickname that rock, ‘the lazy rock’ The lions, later on we learnt that they were all female lions, slept lazily as they enjoyed the early morning sun. I instantly got a liking to a certain lion that decided to sleep tummy up. It was a comical view, the lion slept legs apart, with one of its front paws neatly placed on its stomach. The lioness, slept with its mouth open, and never even at once seemed to realise all the pair of eyes intensively staring at it. I could not help but laugh at the sight of it. On our way to the Maasai village, we managed to catch a glimpse more animals, from warthogs doing a rat chase in the nearby bushes, Buffalos grazing peacefully to a bunch of ostriches hiding their heads on the ground. My excitement was clearly written on my face once we finished our morning drive and arrived at the Maasai village. Before accessing the village, we were met up by the chiefs son, who would also be our guide. We were initially requested to pay 3,000ksh per person in order to access the village, but after a little friendly diplomacy, he agreed on 2,000ksh per person. We were welcomed by eight tall Maasai warriors who sang for us a warrior song. They all jumped in harmony, trying to showcase their physical aptitude. I tried joining them, it was thrilling trying to jump as high as I could, and hitting the ground with a loud thud, unfortunately, I could not keep up with them, and after a few minutes I had to give up. The warriors were adorned with beadwork and had themselves wrapped up in ‘Shukas’ which is a traditional checked cloth, mostly associated with them. We moved into the village, and all I can say it was a sight to behold, though not in a positive way. The houses are arranged in a circular shape and enclosed with intertwining bushes piled up together. It consisted of twenty two related families. The place smelled of cow dung and there were flies all over the place. Two things took my attention while at the village, first the children there looked poor, Their faces were covered with snout and flies were all over them. They wore tattered clothes and walked barefoot, and the environment that they were in was heartbreaking. The second thing that struck me was how their houses, also referred to as the ‘Manyattas’ were built. The materials used are mainly, cow dung( cow poop), Soil, wood, cow urine and grass, the women mostly do the building, that could really explain the horrible smell.